The logic is sound: projects and initiatives ultimately require individuals to do their jobs differently. The correlation data is clear (from Prosci and other sources): the likelihood of success increases with effective change management. However, organizations still seem to encounter some reluctance to fully invest and commit to change management. Many practitioners still face the situation where the decision to invest time, resources and budget in change management is not occurring. Below is a cost-benefit analysis for investing in change management, including five perspectives on the benefits of applying change management on projects in your organization. Given the importance of change in today's environment, these approaches to making the case for change management can ensure that change management is viewed as a "must have" and not a "nice to have" on the projects you support. The cost-benefit analysis for change management is not unlike other cost-benefit analyses - you are attempting to show the relationship between what it costs to manage the people side of change and the benefits of applying a structured approach to enabling and encouraging employees to adopt a change. You will only receive the buy-in and investment necessary to apply change management if you can "tip the scale" by showing that the real and tangible benefits of change management outweigh the costs. Benefit perspective 1: three people-side ROI factors - faster speed of adoption, higher ultimate utilization and higher proficiency; change management drives project ROI. Benefit perspective 2: cost avoidance - poorly managing change is costly to the project and the organization; change management is a cost avoidance tactic. Benefit perspective 3: risk mitigation - individuals, the project and the organization are all put at risk when change is poorly managed; change management is a tool to mitigate risks. Benefit perspective 4: benefits realization insurance - consider how much of the value of the project ultimately depends on people doing their jobs differently; change management provides benefits realization insurance. Benefit perspective 5: probability of meeting objectives - data shows that projects with effective change management in place are more likely to meet objectives, stay on schedule and stay on budget; change management increases the probability of meeting objectives. To "tip the scale" toward buy-in and investment in managing the people side of change, the benefits of change management must outweigh these cost components. Speed of adoption - How fast do people adopt the new processes or behaviors? Ultimate utilization - How many impacted employees made the change (and how many did not)? Proficiency - How effective were employees at following the new processes or behaviors? These three factors are unique for your particular change, but are universal in terms of impacting project ROI. Unfortunately, many project teams do not consider, or they make implicit assumptions about, the people side of their change. For example, a team supporting a large IT implementation that gives users new interfaces might implicitly and erroneously assume that all users (100% ultimate utilization) will begin expertly using the system (extremely high proficiency) the day that the system goes live (instantaneous speed of adoption). When the three people-side factors are added to the business case and ROI calculations, you can highlight the importance of change management. The three factors can even be used to conduct sensitivity analysis to generate actual numeric values for the impact the people side factors have on ROI (for instance, if speed of adoption was over six weeks instead of three, and 15% of users did not adopt the system, then the ROI for the project would actually be X instead of Y). We incur significant and quantifiable costs when changes are poorly managed, at both the project and the organizational levels. In addition to the extra costs of fixing the people-side issues that creep up if we ignore change management up front, the organization also fails to derive the value it needed from the project in the first place. Change management is an effective cost avoidance technique we can apply on our projects. Regulations not met resulting in fines/penalties, etc. Additionally, the organization loses the investment made in the project when the project does not deliver results. When change management is applied effectively, these costs can be avoided or minimized. Some of the costs are difficult to quantify - such as morale declines - but some of the costs are very concrete and easily quantified. Another perspective, similar to the cost avoidance perspective, is to outline the potentials risks to the project and the organization associated with the people side of change. Risk management on projects is a well-developed discipline. If your organization already conducts extensive risk assessments on projects, work to position "people-side risk" as one of the risks that is considered along with other risks like financial risks, technology risks, schedule risks and dependency risks. If a project is being planned and has a high "people-side risk" component, then applying a structured approach to change management is the right risk mitigation technique. For the most important and most strategic changes in the organization, much of the value that is expected is tied to how people do their jobs. Applying a structured change management approach is like taking out an insurance policy against the goals and objectives of the project, superficially the portion that depends on employee adoption and usage. 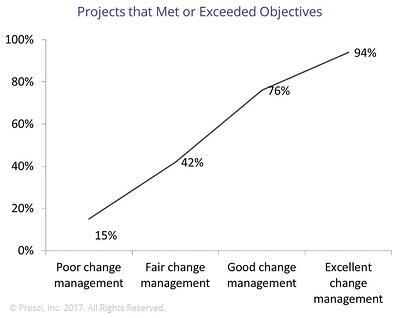 Here, the context for showing the value of change management is tied to the overall value the project is working to achieve. The objectives of the project - as outlined in the project charter, business case or project plan - are a good starting point. For each objective, ask yourself, "is meeting this objective dependent on people doing their job differently?" For some of the questions the answer might be "no" - such as lower maintenance contract costs for a new piece of technology. But, many of the objectives will be tied directly to the people side of change. For these objectives, you can ask the follow up question of, "what percentage of these benefits result from people doing their jobs differently?" This is the amount of benefit you can "insure" by applying a solid change management approach - and the amount of the benefit you are leaving uninsured by not investing in change management. The final benefit perspective is probability of meeting objectives. This is tied to the growing body of data which shows that more effective change management results in a higher likelihood of delivering intended results. Projects with effective change management are five to six times more successful than projects that did not address the people side of change effectively. Below is the graph showing change management effectiveness correlated to meeting or exceeding objectives. Data from over 2,700 change practitioners showed that projects with "excellent" change management in place were six times more likely to meet objectives than those with "poor" change management - and even those using "good" change management were five times more likely to meet objectives. When discussing the value and importance of change management, a cost-benefit analysis can be a powerful framework. These benefits are not necessarily sequenced in the order that you would use them. Rather, know your audience and select the benefit perspectives that will be the most effective. 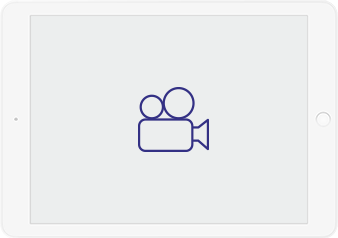 Focus on the concerns of your audience and connect change management to their success by picking the right mix from the benefit perspectives presented above. Based on your audience, your organization and your culture, you can select the most compelling benefit perspectives and work to make them as specific to your change as possible. The right benefits in your cost-benefit analysis can “tip the scale” towards investing in change management. The ROI of change management isn’t difficult to find, it’s the additional value created by a project due to employee adoption and usage. In this webinar we will walk you through how to express a quantified value for change management's contribution to a project. Need More Tools and Books?